Resveratrol from 100l of 1994 Pinot Noir Could Increase Fat Oxidation by 71%, Strength by 18-58% and Endurance by 20% - At Least, If You Could Afford and Drink It Every Day! At least in rodents, resveratrol, the red-wine polyphenol, has been shown to act as an exercise mimetic, exerting profound effects on PGC-alpha expression which protect muscle from wasting due to mechanical unloading (also know as extreme couch-potato-ing ;-) and rodents from the negative side-effects of obesogenic diets by directly modulation gene expression, lipid transport and fatty acid oxidation in skeletal muscle (Chen. 2011; Momken. 2011). Still, most of the oftentimes publicly puffed up data on resveratrol comes from in-vitro studies with dosages of which even the researchers often believe that they are not attainable via oral supplementation. Compared with the aformentioned in vitro data, the numbers and gene essays in a recently published study by scientists from the University of Alberta are actually of great practical relevance (Dolinsky. 2012), because Dolinsky et al. administered their resveratrol orally* (4g in 1kg chow) to healthy rats and - what's even more important for the average trainee - 50% of those rats were exercised for 60min, 5x per week on a treadmill (10m/min to 20m/min; cf. Fenning. 2003) for 12 weeks. *Can I get my resveratrol from wine or food: I cannot emphasize enough that with ~75% of orally administered resveratrol being excreted via feces and urine and an oral bioavailability of resveratrol of almost ZERO (Vitaglione. 2005; Wenzel. 2005), there is no reason whatsoever to cope with any of the ~100 in-vitro studies that are published on a monthly basis hailing resveratrol for this and that and praising it as the god-sent natural remedy for every ailment, except the consistent ignorance towards the profound difference between a cell in a petri dish and a complex organism that is so prevalent among the human lab rats in their white coats, these days. 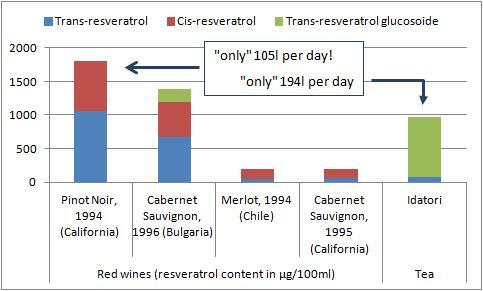 And the data in figure 1 should make it pretty clear that similar benefits as they were observed in the study at hand are not just unlikely, they are simply impossible to be achieved without highly concentrated supplements - or do you want to drink 105+ liters of wine a day to get your daily dose of ~2g of resveratrol? Let's assume you got the ~350$ for your 2g/day of resveratrol powder** to mix with your food (**calculated based on the current price of >90% pure bulk powder in Europe), what would be the results? Would you lose weight? Unlikely. Would you lose body fat? Possible! Would you gain muscle? Very unlikely. So what's all the fuss about then? Along with the +50% increase in AMPK (vs. exercise alone) and the 20% increase in the "mitochondrial builder" PGC1-alpha (cf. "Two days on High Fat Diet Increase the Activity of Irisin Releasing Transcription Factor PGC1-α") it is obvious that, taken at the right dosage, resveratrol is not the supplemental non-starter everyone is let to believe who spent $30 for 60 100mg caps of resveratrol and took a 3-day dose (3x 2g!) spread across a whole month - obviously without the desired outcomes result. As a tool to study (epi-)genetics and the downstream effects and interactions of reduction of cytokines, such as the inteferon-induced proteins, which regulate immune functions, cell growth and apoptosis (Sen. 2000), increases in mitochondrial uncoupling protein 3 (UCP3) and UCP1, higher expressions of adiponectin and thyroid responsive protein and the steroyl-coenzyme A desaturase-1 enzyme, which converts saturated to mono unsaturated fatty acids and plays an important role in controlling inflammation, preventing atherosclerosis, steatohepatitis (fatty liver) and pancreatic beta cell dysfunction (Brown. 2010) resveratrol is a must have. As one of the most expensive currently available supplement with little to no actual human data from studies on healthy subjects, its usefulness for physical culturists is questionable and its cost-benefit ratio is abysmal, to say the least. Brown JM, Rudel LL. Stearoyl-coenzyme A desaturase 1 inhibition and the metabolic syndrome: considerations for future drug discovery. Curr Opin Lipidol. 2010 Jun;21(3):192-7. Burns J, Yokota T, Ashihara H, Lean ME, Crozier A. Plant foods and herbal sources of resveratrol. J Agric Food Chem. 2002 May 22;50(11):3337-40. 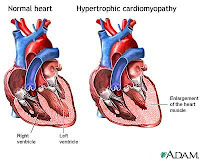 Chan AY, Dolinsky VW, Soltys CL, Viollet B, Baksh S, Light PE, Dyck JR. Resveratrol inhibits cardiac hypertrophy via AMP-activated protein kinase and Akt. J Biol Chem. 2008 Aug 29;283(35):24194-201. Epub 2008 Jun 18. Chen LL, Zhang HH, Zheng J, Hu X, Kong W, Hu D, Wang SX, Zhang P. Resveratrol attenuates high-fat diet-induced insulin resistance by influencing skeletal muscle lipid transport and subsarcolemmal mitochondrial β-oxidation. Metabolism. 2011 Nov;60(11):1598-609. Dolinsky VW, Jones KE, Sidhu RS, Haykowsky M, Czubryt MP, Gordon T, Dyck JR. Improvements in Skeletal Muscle Strength and Cardiac Function Induced by Resveratrol Contribute to Enhanced Exercise Performance in Rats. J Physiol. 2012 Apr 2. [Epub ahead of print] Epub 2011 May 31. 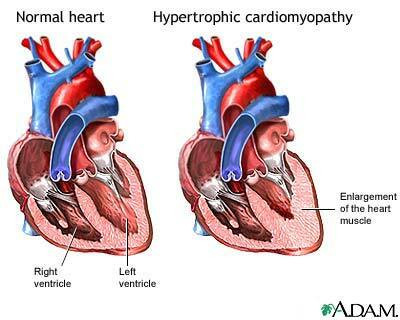 Fenning A, Harrison G, Dwyer D, Rose'Meyer R, Brown L. Cardiac adaptation to endurance exercise in rats. Mol Cell Biochem. 2003 Sep;251(1-2):51-9. Momken I, Stevens L, Bergouignan A, Desplanches D, Rudwill F, Chery I, Zahariev A, Zahn S, Stein TP, Sebedio JL, Pujos-Guillot E, Falempin M, Simon C, Coxam V, Andrianjafiniony T, Gauquelin-Koch G, Picquet F, Blanc S. Resveratrol prevents the wasting disorders of mechanical unloading by acting as a physical exercise mimetic in the rat. FASEB J. 2011 Oct;25(10):3646-60. Sen GC. Novel functions of interferon-induced proteins. Semin Cancer Biol. 2000 Apr;10(2):93-101. Vitaglione P, Sforza S, Galaverna G, Ghidini C, Caporaso N, Vescovi PP, Fogliano V, Marchelli R. Bioavailability of trans-resveratrol from red wine in humans. Mol Nutr Food Res. 2005 May;49(5):495-504. Wenzel E, Somoza V. Metabolism and bioavailability of trans-resveratrol. Mol Nutr Food Res. 2005 May;49(5):472-81.